Grains mixed to lower in the overnight. Beans are unchanged, corn down 1 ¼ cents, and wheat down 4 ½ cents. For the month, HRWW prices are down roughly 18 cents, corn is up 8 cents, and soybeans down 12 cents. The U.S. Midwest weather forecast has a rain system for the northwest Midwest over the weekend and the middle of next week; frequent precipitation is seen for the southeast Midwest over the coming next 10 days. Temps are seen a bit above average, turning cooler next week. Ag Secretary Perdue confirmed that a second tranche of MFP (tariff aid) payments will be coming to farmers, most likely in the same amount as the first, but there are no plans to continue this aid in 2019. 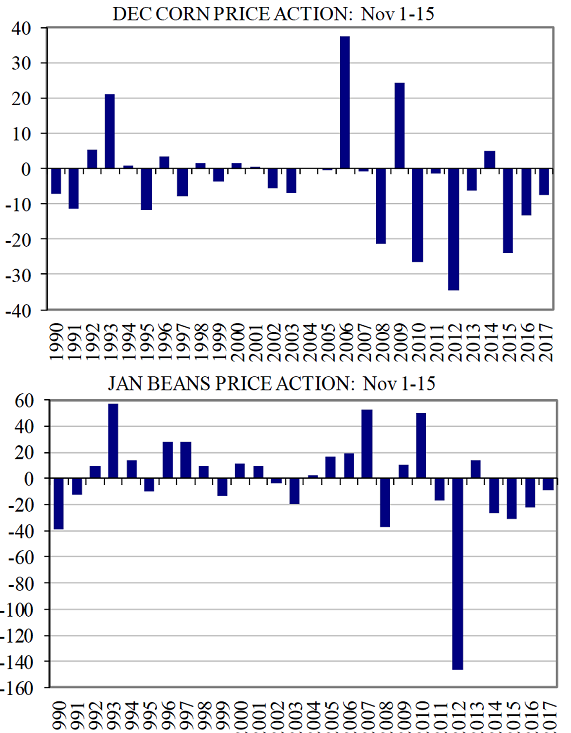 Today’s charts show price action of the December corn and January soybean contracts, with the spot SX going into delivery, for the first half of the month of November, since 1990. (Mostly) bumper crops have unsurprisingly kept those key contracts pressured in recent years during this time frame, with both working on six out of seven down years since 2011.CZ7 continued a general slide since early September, repeatedly topping out in the $3.50/bu area last year from Nov 1-15 before expiring at $3.36 1/4/bushel.